On the other hand, food is one of the topics that unites the world together, we all strive to learn new recipes, new food, new taste, to add a new dish to a table that unites families, friends, neighbors, colleagues, social events, private events, public events and the world. What is better than to share, to love, to help, to feel alive, to care, to feel compassionate for one another. My dish for today, unites the Middle-Eastern & North African cuisine, and it is a dish that is cooked for the world to try and taste. 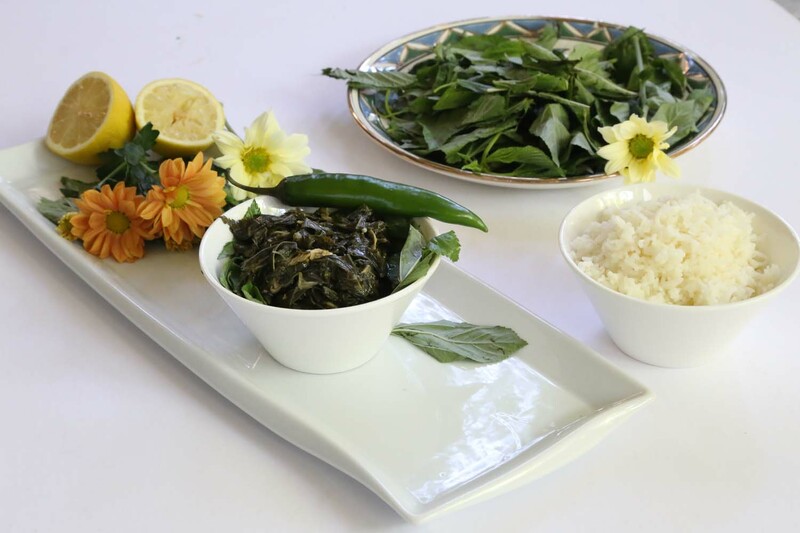 Today I want to tell you more about this famous Mulukhiyah, pronounced in over 10 different accents, and has few different names that all sound similar: ملوخية Mulukhiyah, Mloukhieh (is how I say it), Molokhia, Molokhieh, Molokheyyah Mloukhya, Moroheiya, Mrenda, Murere, Apoth, Kren-Kre or maybe not too much of a similarity 🙂 in the west you might need to ask for Jew’s Mallow or Jute Mellow or Nalta. 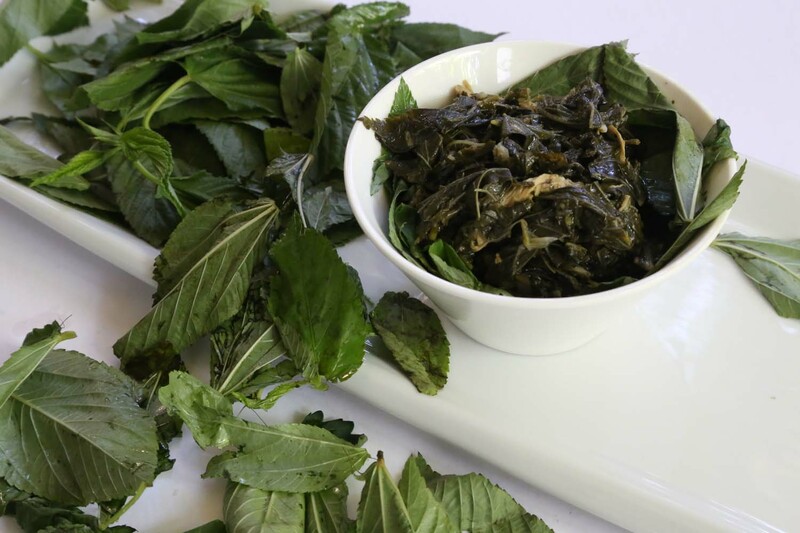 Mulukhiya is a truly delicious green leaves used as a vegetable in the Middle-East, they look like mint but taste somewhat like spinach or somewhat nothing like spinach but you know what I mean. Once cooked, Mulukhiyah results looking slimy and greenly and mostly not too appealing. My photographs on the other hand are my enjoyment of creating a piece of art out of this supposedly exquisite dish. Dates back to the ancients – Pharaoh time and comes from the word “Mulokia” which stands for Kingdom or Royal, because it was eaten only by the royals, kings, queens and nobles during the Pharaoh era. 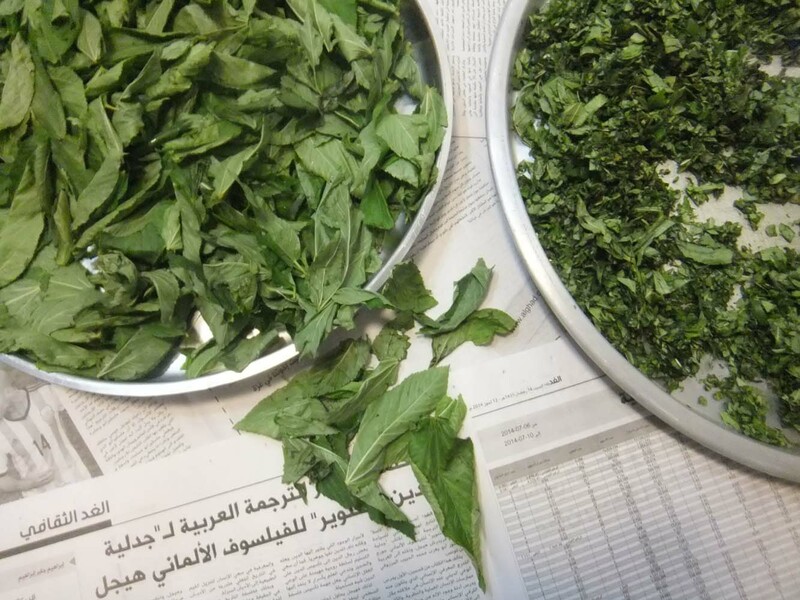 Today every one eats Mulukhiah, royal or not, it is even considered a traditional dish to some Egyptians and it for sure is a main Arabian dish to many Palestinians, Jordanians, Lebanese and am assuming the rest of the arab countries, Middle-East and North Africa. Rich in betacarotene, iron, potassium, calcium, Vitamin C, it also has over 32 vitamins and minerals and is very good for blood circulation. 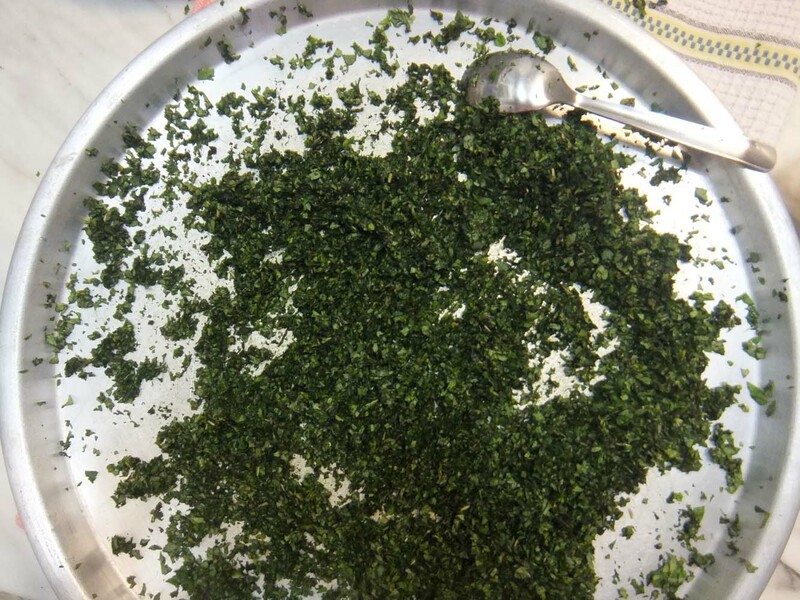 At SUZIE|S Kitchen which is also common between the Palestinians and Jordanians, Mulukhiah comes either in leaves and we call it rough Mulukhiah Khishineh “خشنه”or comes as a soup and we call it soft Mulukhiah Na’ameh “ناعمة”, it is also cooked with chicken or beef. We usually eat it with rice, or pita bread and is usually garnished with lemon. In a small sauce pan, add the chicken breast with the water, salt and bay leaf and leave to boil for 45Minutes. Wash the Mulukhyah leaves very well and leave over towel to dry. Cut the leaves into medium pieces to make the rough leaves dish. Mix the crushed garlic with the cilantro. In a separate medium sauce pan, add the 1/4 cup of olive oil, chopped onion, ginger, coves of garlic, mixture of crushed garlic & cilantro and stir until they become a little yellowish. 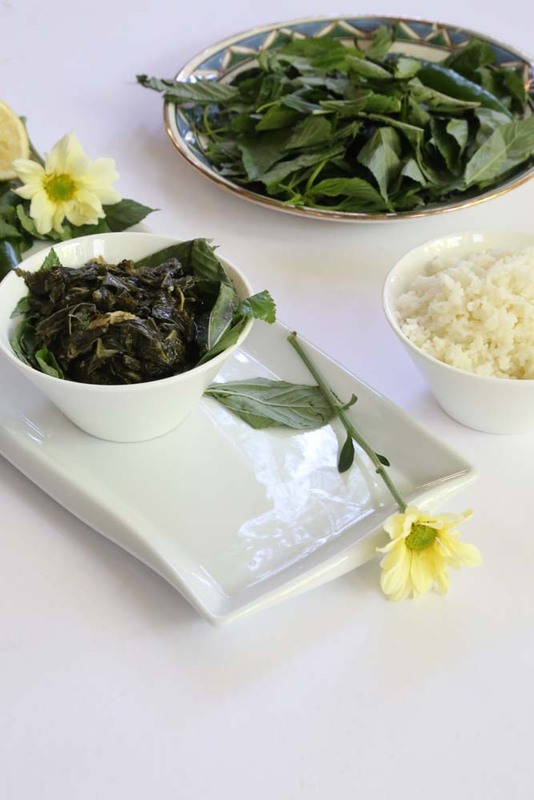 Add a hand full Mulukhieh leaves into the sauce pan and stir, then add another hand full and stir, keep doing this until all your Mulukhiah leaves are in and mixed well with ingredients. 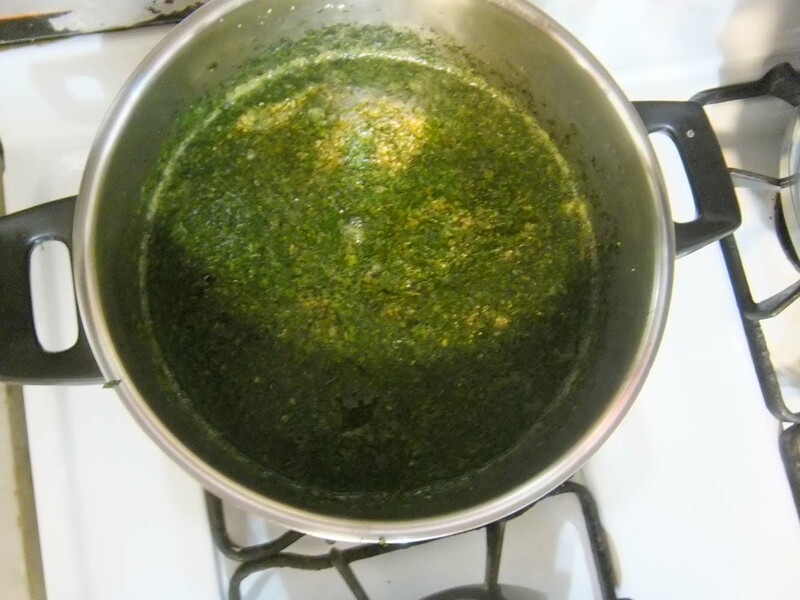 Once the Mulukhiah leaves turn dark green, add 1cup 1/2 from the chicken broth. 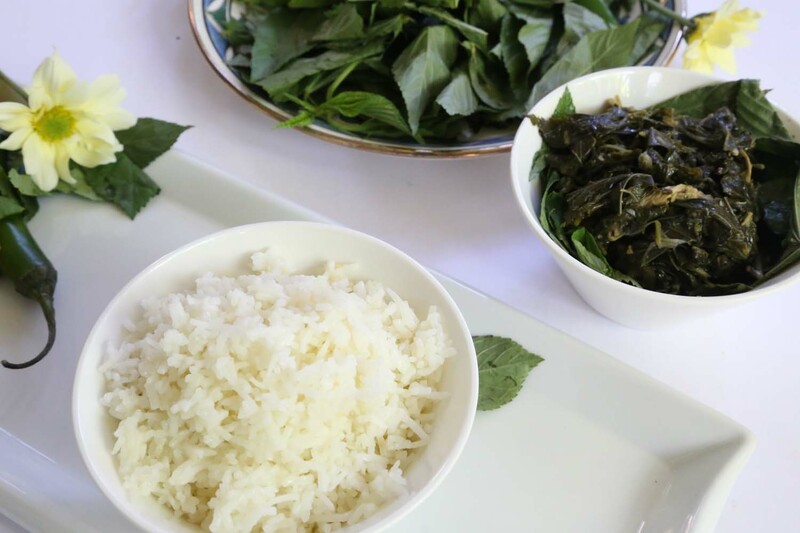 With your hands, start shredding the chicken breast into large pieces on top of the Mulukhieh sauce pan. Leave for 20 minutes to boil. Your Mulukhiah is ready to serve. For Garnish; on a separate frying pan, add 2 tablespoon of olive oil, crushed garlic and 2 tablespoon of cilantro, and cook together for 3 minutes until golden. Add your Mulukhiah in your serving dish and add the mixture of garlic and cilantro on top for garnish. 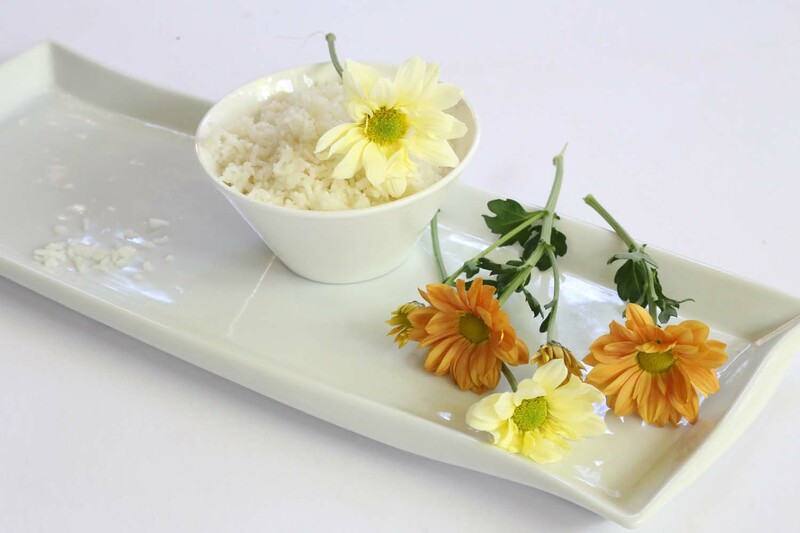 Lemon is always served on the side for people to add to taste over their dish. Optional: Add roasted pine nuts to your serving dish. 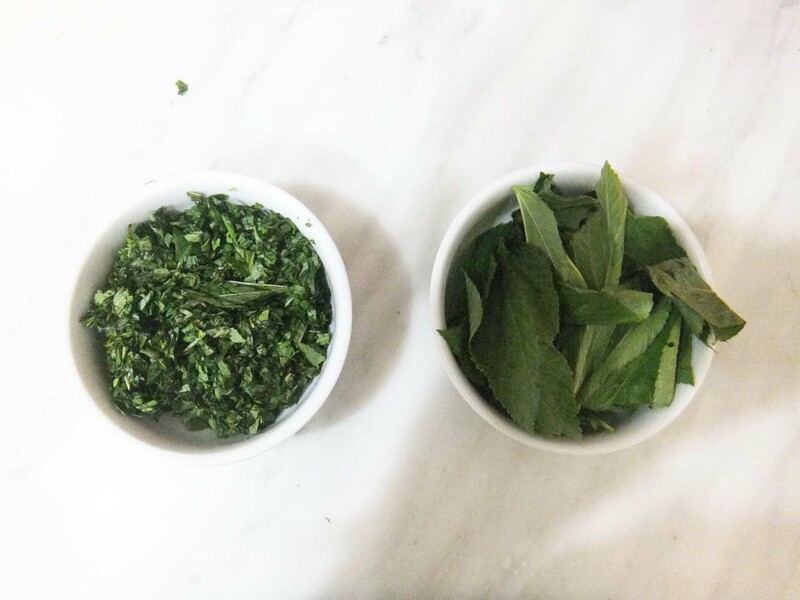 Using a herb mincer, mince the mulukhiah leaves to very finely chopped Mulukhiah. In a separate medium sauce pan, add 3 cups of boiled chicken broth. Add all the minced Mulukhiah into the chicken broth and stir. Once the Mulukhiah is melting with the broth which takes about few minutes, start shredding the chicken breast with your hands into large pieces on top of the Mulukhieh sauce pan. Leave for 5 minutes to boil. On a separate frying pan, add oil, crushed garlic and dry cilantro, and cook together for 3 minutes until golden. Add this mixture on top of the Mulukhiah and stir for a quick boil. 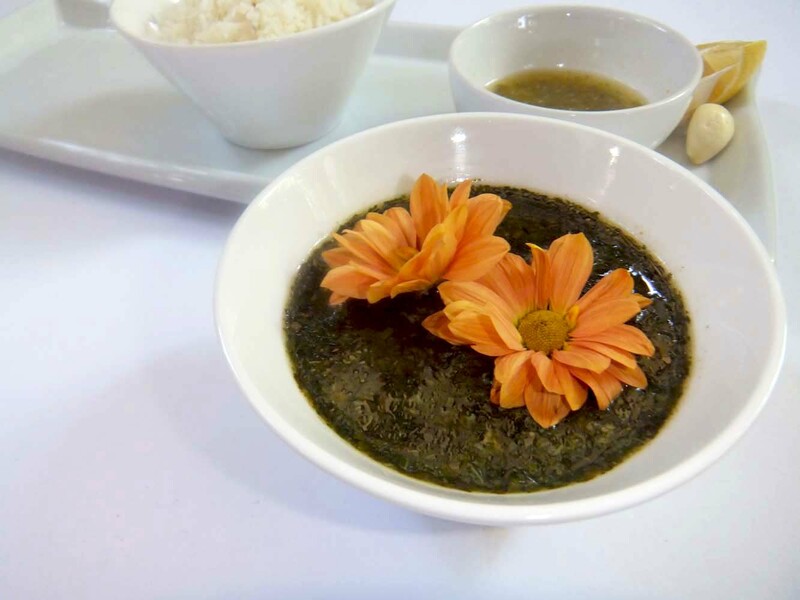 Your Mulukhiah soup is ready to serve. 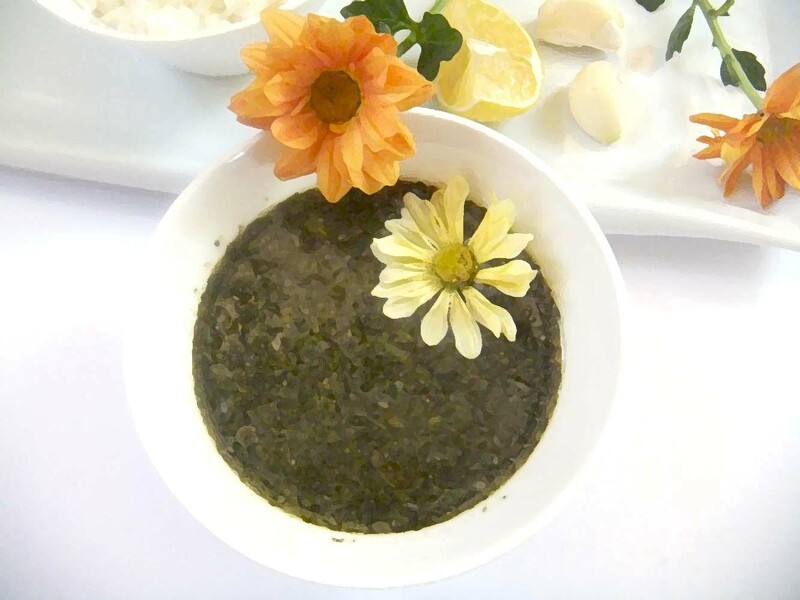 MULUKHIAH IS NEVER EATEN AS A SOUP, WE USUALLY ALWAYS ADD RICE OR WE EAT IT WITH PITA BREAD. 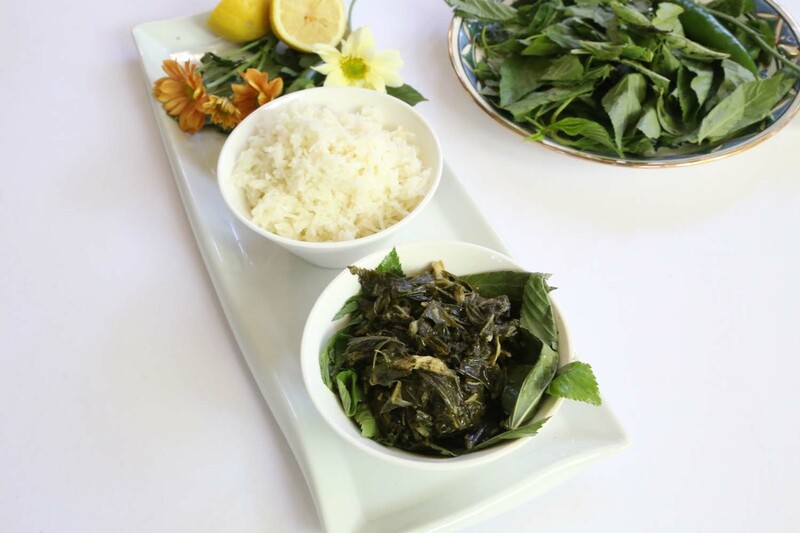 SUZIE|S Speciality: If you are a fan of spicy food, we always have Filfil ou Limoon (Lemon & Chili sauce) over the Mulukhiah, this is always added as a garnish to taste, so we do not recommend you add it to the serving dish, but instead to your own plate. Please find how to make it in the Mansaf recipe.